The Van Oldenbarneveltstraat, along with the Van Oldenbarneveltplaats, form an important thoroughfare in the infrastructural supply routes for the city centre. It is also an important connection in the tram network as 30 trams pass here each hour. The tram stops in this street lay at the heart of the (car-free) city centre. Needless to say, shops and restaurants are in abundance here. The flow of trams has such a high priority that the trams got their own, completely separated, domain here. The remaining traffic uses the parallel one-way street. The street has a modern style, but it has very little natural elements. Furthermore, the roadway is regularly used as a place to unload the supply vehicles. The multifunctional parking/loading and unloading spaces do not yet have the desired effect, as there are too few to accommodate the many suppliers. The decision has been made in the design of the Van Oldenbarneveltstraat to separate the trams from the other traffic. A classic arrangement would turn the street into a place that is dominated by cars and trams. A design based on shared space would create a lot of conflicts between the different types of vehicles. Therefore, these alternative design approaches would not be very functional here. 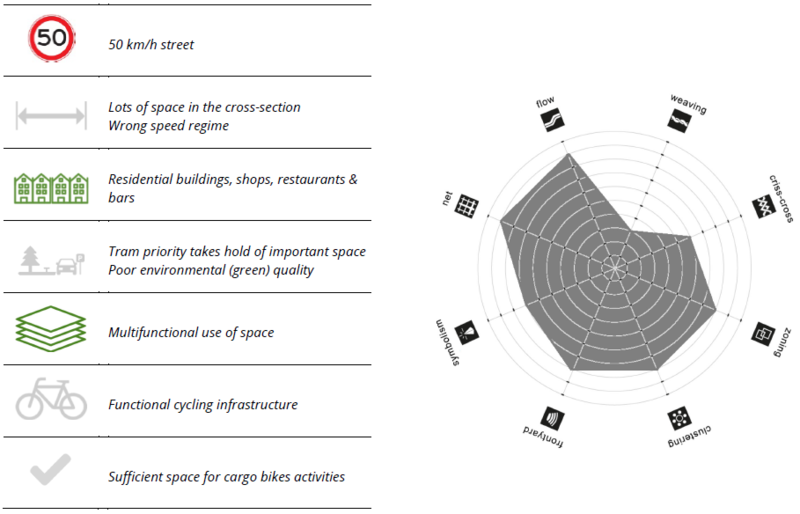 The current speed regime of 50 km/h is inappropriate for both this layout and the inner-city space. Goods are being unloaded here during business hours and the street turns into a pedestrian and cyclist dominated space in the evenings. A speed regime of 30 km/h would suit this environment better, even more so when considering the roads function in the urban grid. It appears, from the scoring of the quality aspects of Functional Ambiance, that the current quality of the Van Oldenbarneveltstraat is quite mediocre. 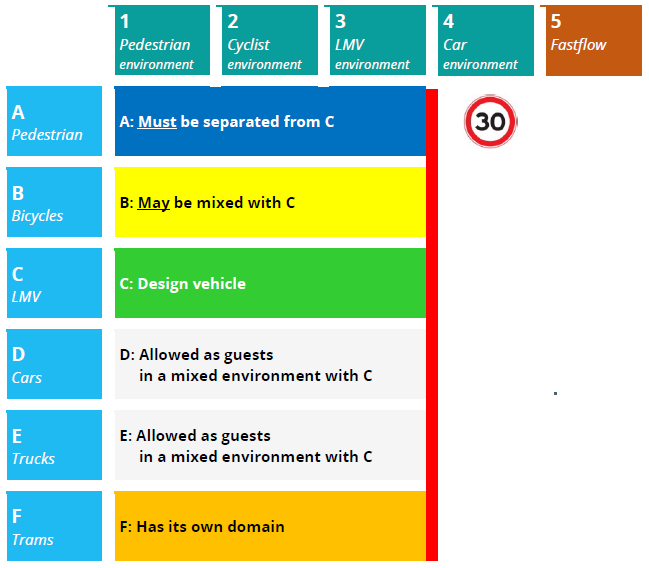 However, most problems can be tackled by changing the speed regime in the secondary streets in the city centre to 30 km/h. Further development is possible in developing the environmental (green) quality. The amount of aesthetic green in the design of the street is way too low. The entire area consists of bricks and pavements and it has lost its connection to nature. 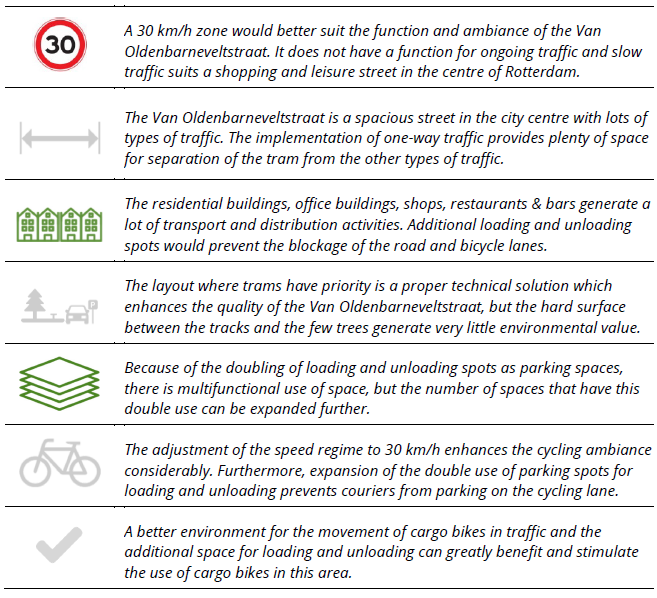 Also, the expansion of the dynamic use of space, in this case, the use of loading and unloading spaces as parking spaces in the evening, can contribute to a higher spatial quality for cyclists, cargo bikes and LMV. This way the street remains accessible for all types of traffic.